Caló d’en Pallicer: only a few minute’s walk away from the main Santa Ponsa beach. With its close proximity to the centre, this cove is very popular during peak season. However, if you visit it in May, you’ll discover an oasis of relaxation with shallow water and high cliffs that ensure the safety and protection of your kids. This cove is encased in crystal-clear water and dotted with comfortable sun loungers and parasols, making it perfect for those who seek a different experience on their beach holiday to Majorca. Magaluf: beautiful coves that make the hike worth it. Magaluf, neighbouring town to Palmanova, where our Tropico Playa hotel is found, boasts two of the island’s most gorgeous must-see coves: Cala Falcó and Caló de Sa Nostra Dona. The former takes about a 40 minute’s easy walk to get to from Magaluf town centre but as you sit on the rock face with the beach below you and miles of crystal-clear water laid out before you, whilst admiring Ibiza in the distance, you’ll instantly believe us when we say the effort was worth it. 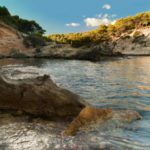 From Cala Falcó you can hike to Caló de Sa Nostra Dona, or, if it’s too difficult for you, turn back on yourself and walk along the flat road to the cove. Either way, the views and gorgeous golden sand are not to be missed. Caleta des Frares and Platja d’Alcanada near to Puerto Alcudia. If you don’t mind a rocky beach when in exchange you can enjoy very clear turquoise-blue water and take part in a range of water sports including diving, then the former cove is for you. This remarkable cove is the perfect addition to your adults-only stay at our Piscis Hotel if you fancy discovering the coral reef or bathing in some of the clearest water you’ll ever see! On the other hand, Alcanada beach was made for those seeking utter relaxation on their stay with us. All you have to do is walk for 5 minutes from our adults-only hotel to the bus stop and walk for another 7 minutes after you get off at the stop for this beach. Overall, the journey takes about 20 minutes but when you arrive, you’ll be taken away by the sheer beauty of this exquisite beach.